Written by Moore Good Ink. If you were engaged in a conversation with a barmaid and she asked you to illustrate differing valve angles and to explain their relevance in simple terms, you might be challenged. So here’s how it’s done. 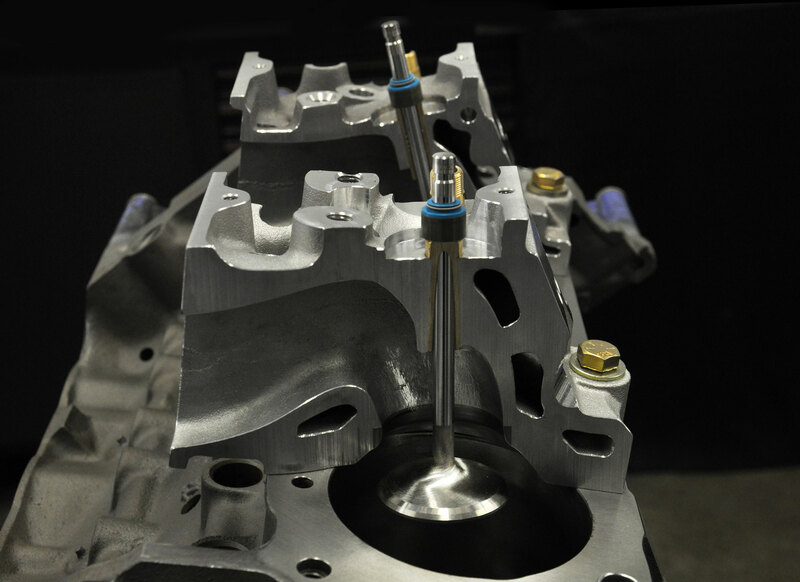 In addition we depict the cylinder head’s short-turn radius and describe its merits, identify the deck thicknesses and indicate its benefits, and characterize the difference between a standard port and a raised port. Free beers all round please! 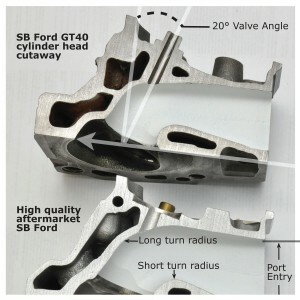 These cutaways provide an invaluable insight into the evolution of Ford Windsor cylinder heads, particularly the induction tracts. 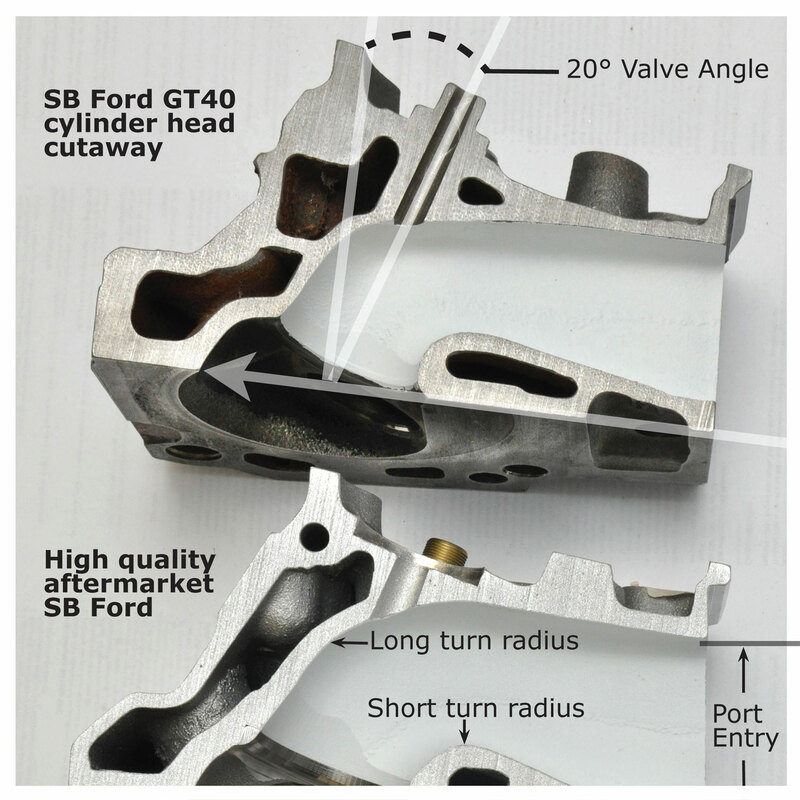 At the top a high performance Ford cast-iron GT 40 cross-section is depicted; in the middle the induction section of a high quality 225cc aftermarket cylinder head; and at the bottom Kaase’s innovative P-38. The intake (and exhaust) valve angles of the top and middle examples are inclined to 20 degrees from the deck face whereas the intake valve of the P-38, in contrast, adopts a much reduced angle of 8.5 degrees. Its exhaust valve is set at 10 degrees. Thus all valve tips are inclined inward toward the induction system. However, unlike the top two, the P-38 additionally adopts a cant angle: intake 4.5 degrees and exhaust 4 degrees. 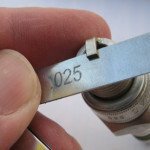 This means the tip of the valves also leans either fore or aft (frontward or rearward). It’s odd isn’t it, for you’d think the induction tracts of the top two cutaways offer the fastest route for induction gases traveling to the cylinders? In fact, they probably do just that as eight percent of the gases moving toward the chamber and cylinder are actually fuel and therefore heavier than air. But it’s equally probable that most of those gases will exit in the long turn area. 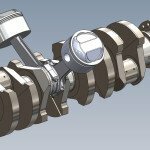 To achieve a more even distribution of gases around the valve, Kaase introduced a deep valve bowl and a high short turn around the mid-section of the P-38’s intake port. Obviously to accommodate standard intakes, the P-38 port entries have to remain in the original position. Nonetheless, this head could easily transcend the confines of high performance street use. By raising the induction port entries it could be transformed into a superior race head, as sufficient material is available to contemplate such developments. It’s a beguiling prospect but for now the P-38 excels in the high performance environment. 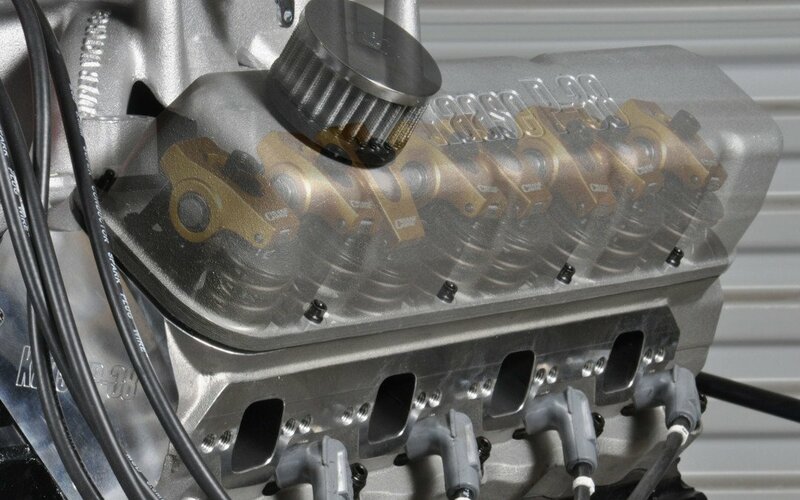 To combat the additional pressures generated by superchargers, turbochargers, or nitrous oxide, the P-38 is distinguished by its extra deck thickness. Though its 10-bolt head uses 1/2in diameter bolts, and therefore applies greater clamping force than conventional 7/16in counterparts, the extra deck thickness gives the head greater robustness. The thicker the deck, the better it clamps the cylinder head gasket. 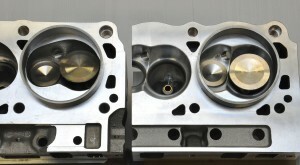 In the aftermarket head (left) notice how close the intake valve resides to the chamber and cylinder wall, represented here by the short, round sleeve. On the right, Kaase’s P-38 intake valve, aided by its compound angles (8.5 x 4.5 degrees), displays plenty of room between its edge and the cylinder wall. Providing adequate space all around the valve as it opens promotes even air-fuel distribution to the cylinder. All of today’s successful race engines are built this way. The closest cutaway reflects important details of Kaase’s P-38 cylinder head: port shape, valve angles, high short-turn, deep valve bowl, and increased deck thickness. With regard to valve location, though the difference between its 8.5-degree valve angle contrasts sharply with the 20 degree angle beyond, it is the P-38’s 4.5-degree canted valve angle (fore and aft) that provides the larger part of its allure. Kaase’s P-38 head design is not innovative. He copied the same canted valve design used on Chrysler’s Hemi 6 engine produced in Australia from 67-81. Sometimes “innovation” is as simple as bringing otherwise pre-existing principles to a product that doesn’t currently have it.. Though Kaase was the architect of the P-38 small-block cylinder head, its initial specifications were dictated by the Ford Motor Company, who had invited him and others to prepare street/strip prototypes for their consideration. 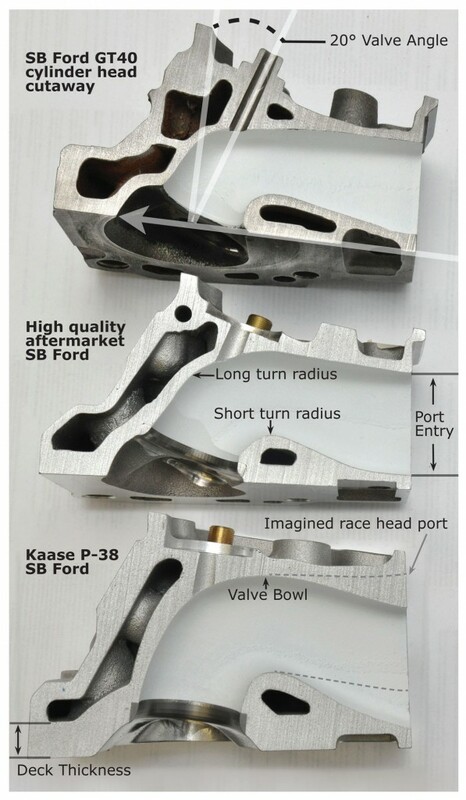 Never intended to be a full race head, Ford clearly outlined their requirements, the most prominent of which was the retention of standard port locations. Kaase recognized that if the ports couldn’t be raised, the positions and angles of the valves had to be altered if any improvement was to be made to the standard formula. Consequently, this is why the current arrangement was adopted. 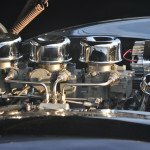 Though Kaase had successfully developed the Super Cobra Jet cylinder head for Ford, on this occasion they decided against the P-38 in favor of another which, oddly, featured raised ports in stark contradiction to the original objective. To recoup his expenditures, Kaase subsequently offered the P-38 for sale directly from his Winder, Georgia factory.